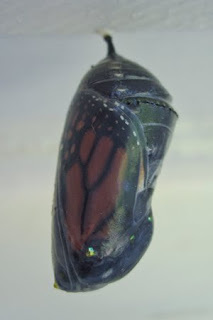 I have been checking on the Monarch chrysalis hanging from the top of our window sill to see when the chrysalis would start to turn darker in color. The chrysalis has been there for over a week so I knew it would be any time. 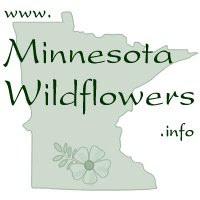 It was breezy and cool yesterday after overnight rain and a cold front moving in. Not the most ideal time for the monarch to emerge. Yesterday morning the chrysalis turned dark in color, with the orange wings showing through. I took this photo around 10:30 in the morning and went back inside. 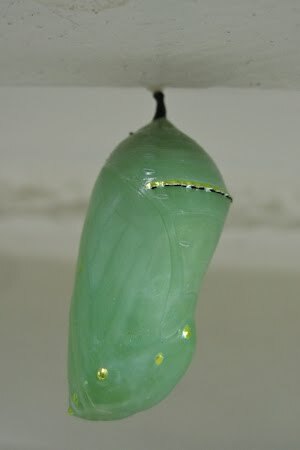 So unfortunately, I missed it pushing its way out the bottom of the chrysalis. 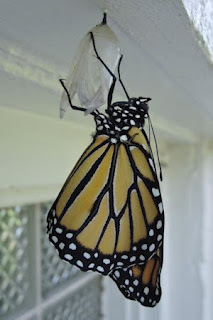 When I returned the butterfly was clinging to the chrysalis shell drying its wings. By 1:30 pm it had already flown away. Later in the afternoon we had several adult butterflies in the yard, most of which looked newly emerged and untattered. Maybe next year I'll get some photos of the whole sequence.